A survey of the German community indicates support of around 41 percent for the SegWit2x hard fork. It also shows that the opposition is mostly based on politics and not on a dislike of the technical parameters it wants to activate. Last but not least the survey discovers a strong wish of the community to prevent a split of the Bitcoin blockchain. Germany’s most popular blog about Bitcoin, Bitcoinblog.de, surveyed sentiment surrounding SegWit2x. 464 readers participated. This is 10 times as many people as from the Bitcoin Munich Meetup, which voted for an anti-SegWit2x statement; and still twice as many participants as the Brazilian Facebook group, which resulted in another statement against SegWit2x. These numbers make the survey of Bitcoinblog.de one of the largest community surveys about SegWit2x, if not the largest. Considering options, framing, audience, and language, this survey is one of the most balanced and objective assessments of what the users think about the SegWit2x hard fork. Hence, the findings should be highly interesting for every stakeholder wondering how to handle the fork. Methodologically the survey was straightforward; it put out around 20 statements in a box and asked the readers to agree with as many items as they wanted to. Obviously, this method has some shortcomings. First, it is not clear if agreements to different statements represent same or different users. For example, there have been three statements against SegWit2x, and each got nearly 30 percent agreement. Do they represent up to 90 percent of the participants, or just 30? There is no valid answer on this. Second, the survey gives no detailed information about those who did not agree. Do they oppose the statement – or are they just indifferent on the issue? Given these shortcomings, the survey also has its advantages. It shows unquestionable minimal agreements to a lot of statements. For example, 41.4 percent agreed with the SegWit2x hard fork, and 37.5 percent with that the stronger chain should destroy the weaker one. These are hard findings which seem highly relevant to determining consensus. Some attacked the survey because they felt that the questions have been biased in favor of SegWit2x. Language and selection of items might represent the author’s stance on the issue. However, the survey still matches the requirements for unbalanced and independent voting far better than any other poll or vote on SegWit2x. All critique was voiced in a polite and constructive manner. Only one of 464 participants was hostile. She accused the author of being a paid shill of Roger Ver and Jihan Wu. That she took 10 percent of all comments is an interesting and important lesson about how a vociferous toxic minority can poison the debate. For every zealot who submits ten angry comments, there are 450 Bitcoin users who submit no comment. Keep that in mind when assessing user’s opinion by social media. There have been 11 answers about SegWit2x. Five of them are pro-SegWit2x, six against; this is the core of the survey. The results show that the support for SegWit2x surpasses the opposition. A statement like “the community is against SegWit2x” seems clearly wrong. The item “I’m OK with it” got most support; 41.4 percent. Nearly 38 percent agree with that the Core developers should stop their opposition and join SegWit2x. Around the same number agreed to that the outcome of the hard fork – the 2MB base block size – is necessary. However, with around 30 percent three answers against SegWit2x also garnered strong support. The comparison of these findings suggests that the community is deeply split over the issue. A more concrete analysis can be performed by separating the answers. One group of answers is about the technical parameters SegWit2x wants to activate – SegWit and 2MB – while the other group is about the SegWit2x fork itself. Separation of the answers will help us to understand the rationale behind the opposition better. If we just consider the technical parameters of the fork, the opposition seems to be significantly smaller. While nearly 37.5 percent agree that the state of 2MB and SegWit is not just acceptable, but necessary, only 17.9 percent fear that this will decentralize Bitcoin significantly. It seems, more than 80 percent expressed no general opposition against the technical parameters of 2MB and SegWit. If we look at the opinion toward the SegWit2x hard fork, the situation grossly changes. Around 30 percent criticize; (1) how SegWit2x was agreed – in a backdoor deal, (2) that it has no strong replay protection and (3) that Core does not support it. Only 15 percent agree with the answer that SegWit2x is an attack, and less than 10 percent prefer a chain split over letting the “SegWit2x coup” succeed. This confirms that there is only a vociferous minority which rings the bells of war over SegWit2x and will do all they can – even split Bitcoin – to prevent it. 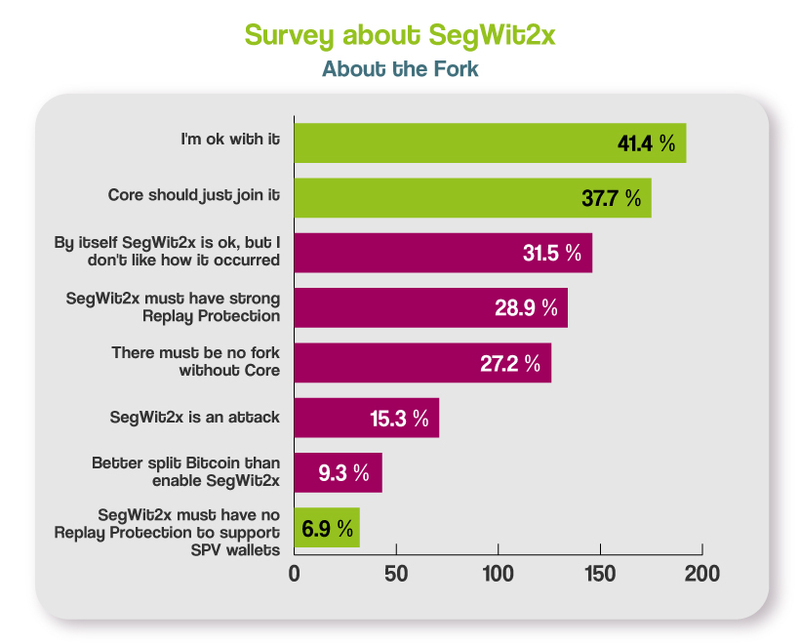 The most important key finding of the survey may be that most opposition against SegWit2x is not based on a dislike of the technical parameters the hard fork aims to activate, but more for political reasons against the fork itself. But this is not the only important finding. What Coin should get the BTC ticker symbol? In case of a chain split, it is an important question, which coin is listed on exchanges as BTC and which as an altcoin. Bitfinex decided to list Bitcoin legacy as BTC and SegWit2x-coin as B2X, while Blockchain.info and Xapo promised to list the coin with most hash power, and Bitcoin.com and an exchange from Thailand even announced to list SegWit2x-coin as BTC without specifying that it needs majority hash power. So the question of the ticker symbol is highly confusing. If different exchanges list different coins with the symbol BTC, the fork could result in severe and disruptive confusion of market participants. What do the users think? After more users have been in favor of SegWit2x than against it, you could expect them to vote for it to get the ticker symbol BTC. However, this is not the case. The most votes agreed with that old Bitcoin keeps the ticker symbol. 24.6 percent want the exchanges to list the coin with the most hash power, and only 18.1 percent want SegWit2x. The price is just for 9.9 percent the most important criterium. However, if we assume that SegWit2x gets most hash power, more than 42 percent vote for listing this coin as BTC. Or, to say it in other words; more than 42 percent are clearly against listing Bitcoin legacy as BTC if it does not command the highest hash rate. If this were a political vote, the hash power would become the president-maker. Another really interesting question is that of unity and splits. The markets seem to have agreed that in case of a split, the exchanges just list both so that people can trade both bitcoin. For exchanges, this is a no-brainer, as they earn money through trading fees. However, this seems not to represent user’s preferences; 40.1 percent agreed with the answer that they are OK with the stronger chain destroying the weaker one, while not even 10 percent are willing to pay the price of splitting the chain to prevent the success of SegWit2x. The most surprising – and strongest – finding of the survey is that users want unity. More important than if it is the SegWit1x chain or SegWit2x chain is for them that there is only one Bitcoin. However, the participants of the survey have not been completely consistent on this issue. While many support the stronger chain destroying the weaker one to prevent a split, nearly 30 percent want SegWit2x to implement replay protection, while not even seven percent think that SegWit2x must have no replay protection. But the truth about replay protection is, that it is a good decision to have them when you want to create an altcoin, but a horrible choice, when you want to upgrade Bitcoin without a split. Strong replay protection breaks compatibility with every existing Bitcoin software. If this contradiction is based on something we don’t know or on a lack of technical knowledge, remains a mystery.